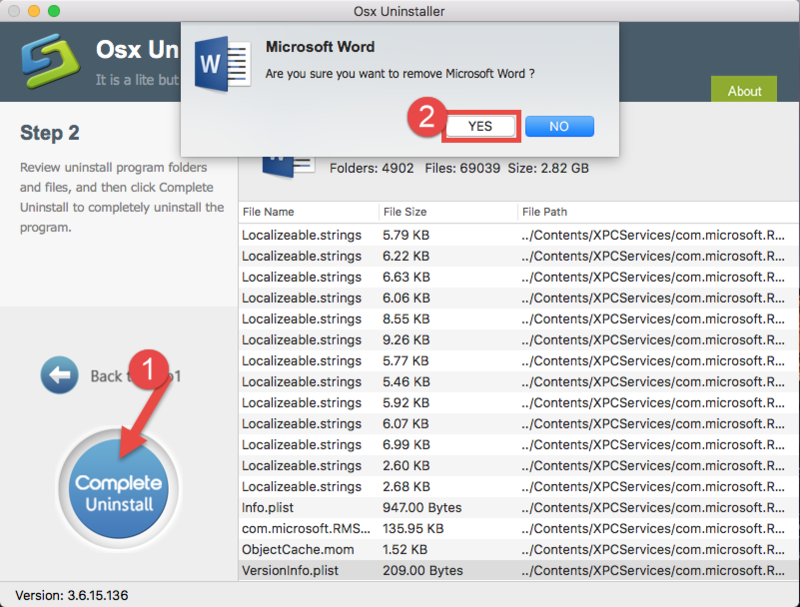 Wanna uninstall Microsoft Word 2016 for Mac? Have no clue how to delete app leftovers? 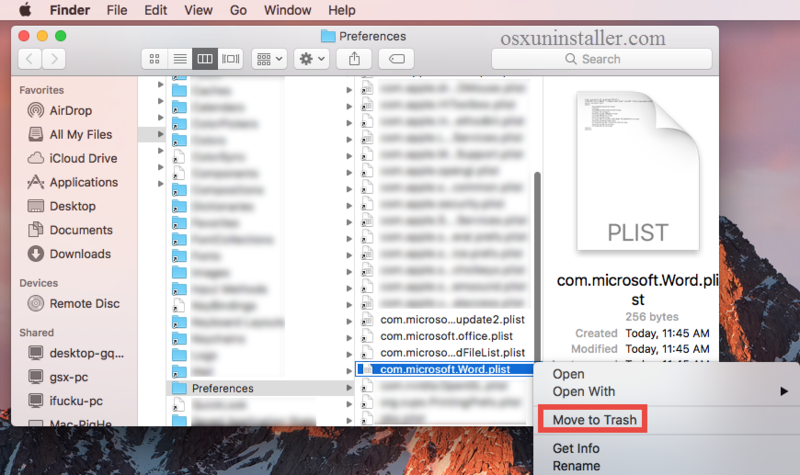 The tutorial will show you the proper way of uninstalling Mac apps. Microsoft Word 2016, released on macOS in 2015, is the word-processing app in Office suite. Though providing some new features and improvements, this app still has some overhead. Take some examples. Some features from Windows are missing in the Mac version, and some Mac features are not supported yet in Microsoft Word 2016. 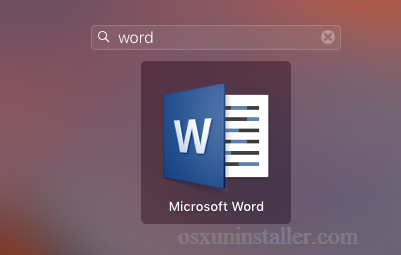 Many users might have to install this app for working or studying purposes, while others may have decided to uninstall Microsoft Word 2016 from their Macs. Uninstalling an app on macOS has been simplied, compared with on Windows, but there still exist some issues. When you move Microsoft Word 2016 to the Trash and empty it afterward, the main app itself is gone instantly, but many associated file and folder are left behind, occupying certain space on your disk. Then how to thoroughly uninstall Microsoft Word 2016? 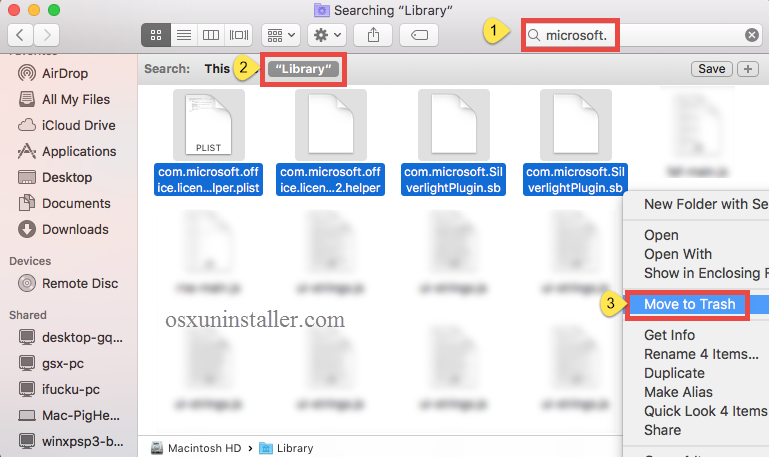 In this post we list several ways to guide you through the uninstallation successfully. You can adopt the most suitable method as you like. Is there a solution to help uninstall Microsoft Word 2016 effortlessly? Sure. Here we would like to introduce a handy tool to assist you in removing any unwanted app. 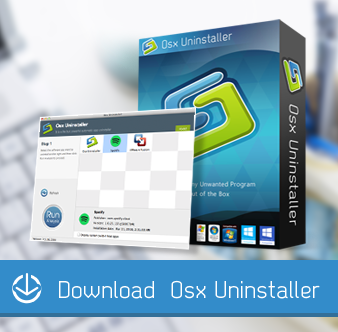 Osx Uninstaller is a lightweight yet powerful application designed for all level users to perfectly remove problematic, stubborn or malicious apps. To completely get rid of Microsoft Word 2016, you just need to do 3 simple steps: launch > select > uninstall. 1. 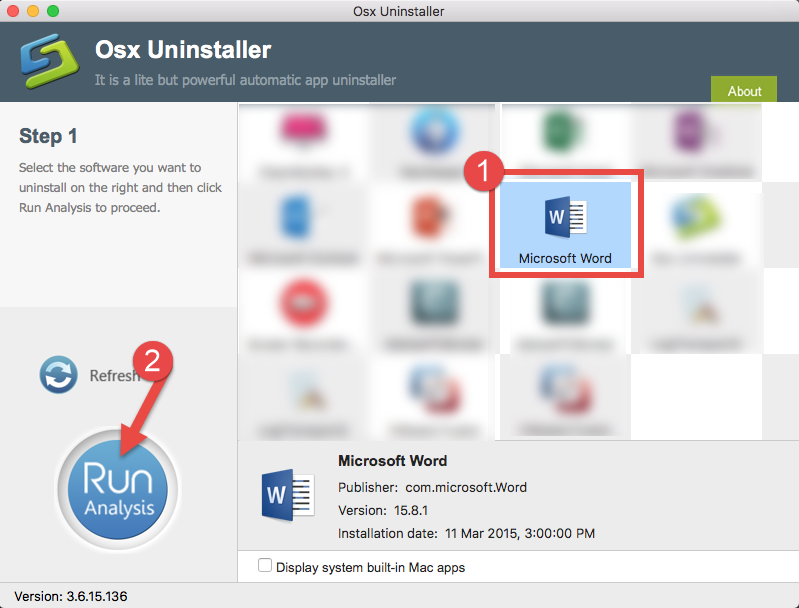 Quit Microsoft Word 2016 if it is running, and then launch Osx Uninstaller. 2. Click Microsoft Word 2016 icon, and click Run Analysis to run a scan. 3. Review the components belonging to Microsoft Word 2016, click Complete Uninstall and then Yes in the pop-up dialog box to perform a thorough uninstall. See? Uninstalling Microsoft Word 2016 has never been so easy and quick before. 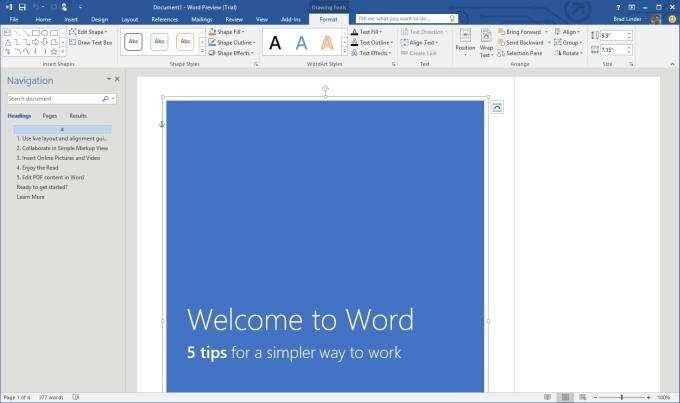 Now Microsoft Word 2016 has gone from the interface as well as your Mac system. 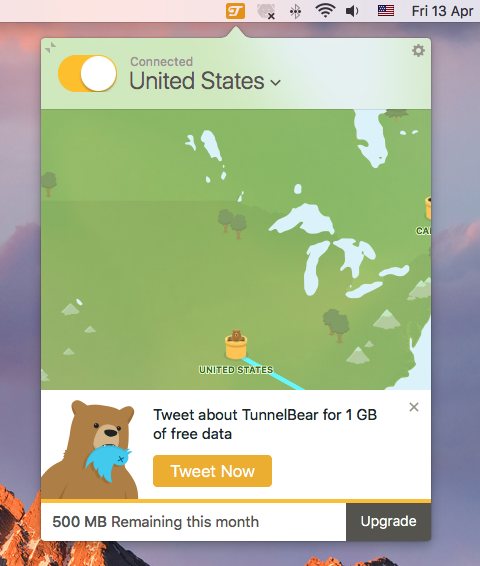 Don’t hesitate to give Osx Uninstaller a try and you’ll love the convenience it brings. 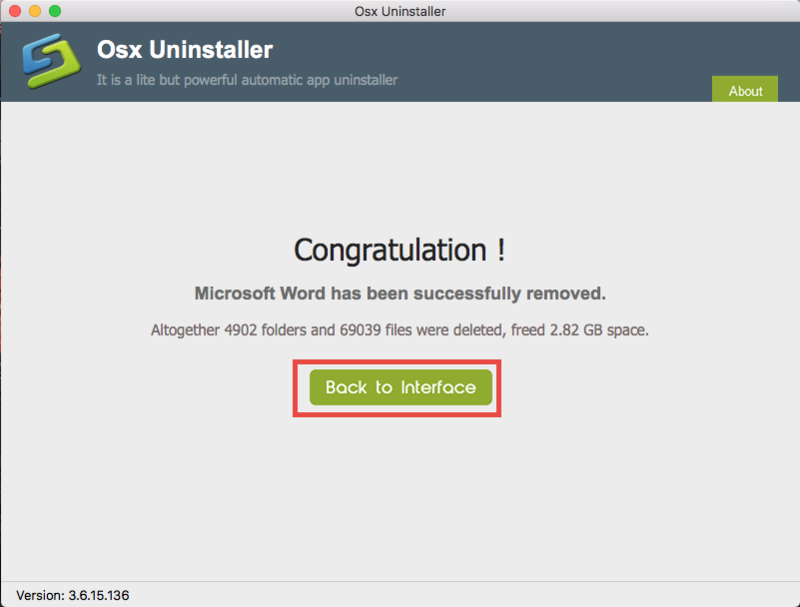 It saves much time to uninstall Microsoft Word 2016 through Osx Uninstaller. But if you insist on uninstalling Microsoft Word 2016 manually, here are the detailed steps that you can follow to get rid of Microsoft Word 2016 and associated components. Open up the Activity Monitor from the Dock, Launchpad, or Spotlight. Type Microsoft Word in the search box, click to select the process with the name of Microsoft Word, and click the Quit Process icon in the left corner of the window. 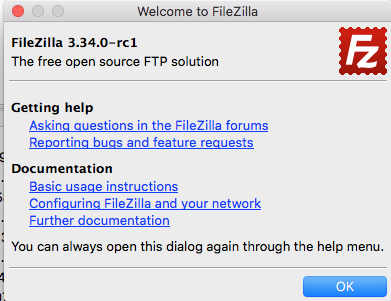 Click Quit in the pop-up dialog box, and if that doesn’t work, then try Force Quit. 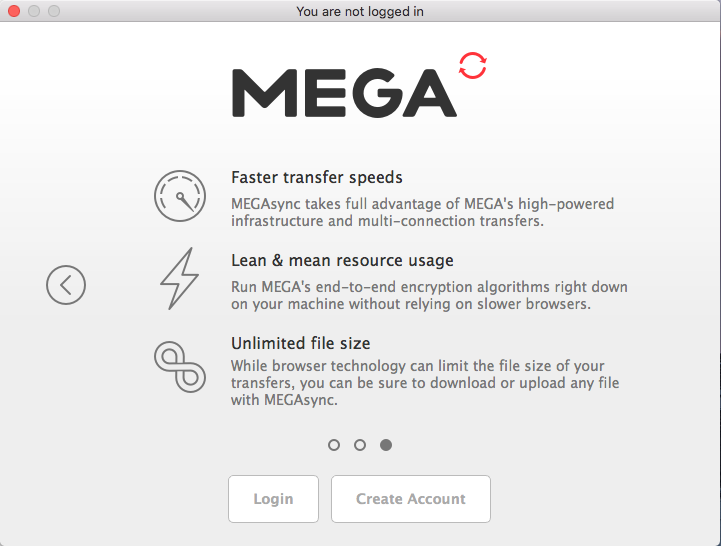 Now make sure that you have logged into with an administrator account, and you might be asked for the password when you try to delete something in the Finder. 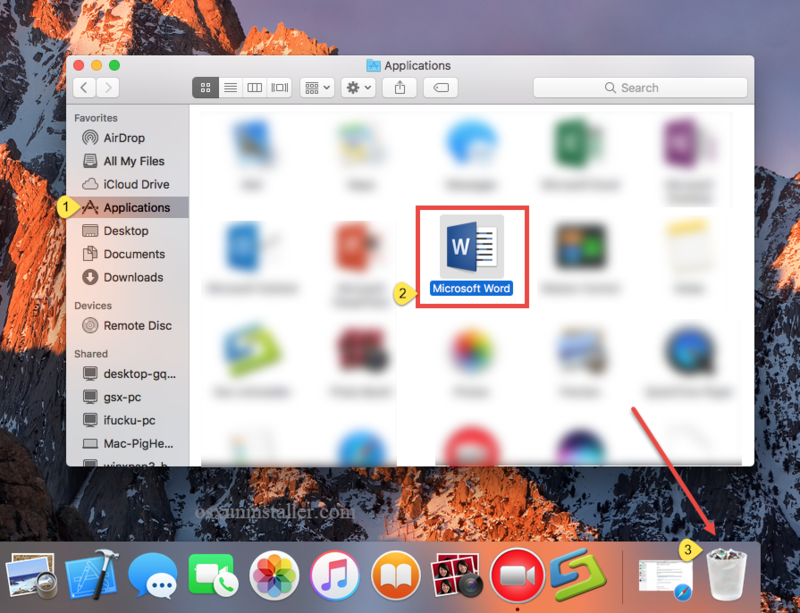 Click the Launchpad icon on the Dock, and type Microsoft Word in the search box. Hold on Microsoft Word icon until the icon begins to wiggle and shows the “X” . Tap the “X” in the left top corner to remove Microsoft Word 2016 from there. This way works for the apps which are downloaded and installed via the App Store. Once you click the X icon, the app will be uninstalled instantly from your Mac. 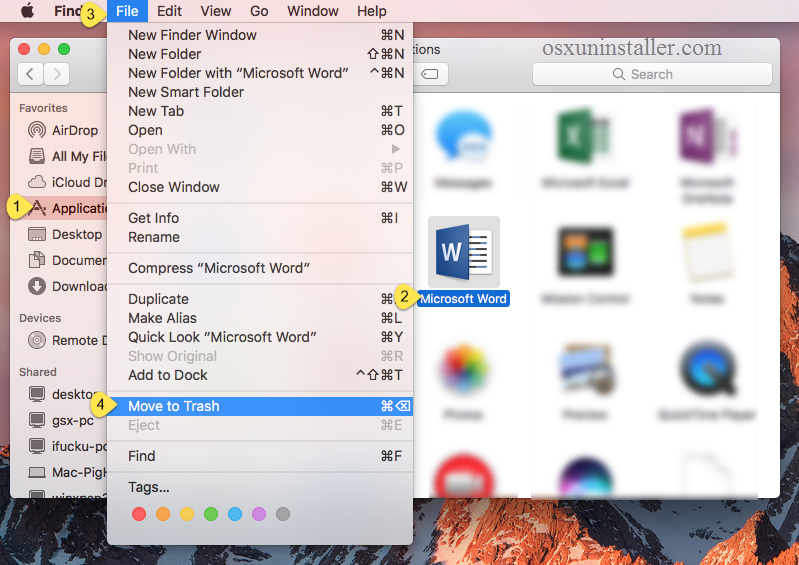 Select and drag the icon of Microsoft Word 2016 to the Trash in the dock. Also, you can uninstall an app by these options: right click on the app icon > choose Move to Trash; select the app > click on File menu > choose Move to Trash. Notice: the act of emptying the Trash is irrevocable, and everything in the Trash will be deleted immediately, so be cautious when you are emptying your Trash. 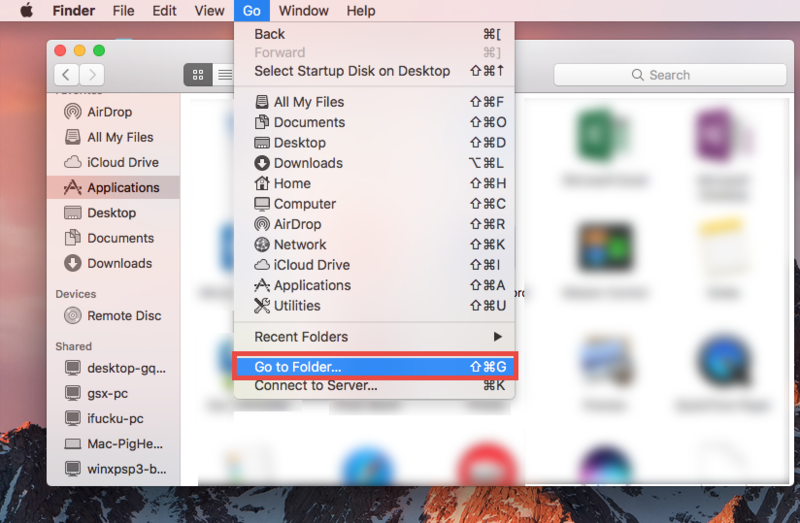 The drag-and-drop move is the universal method to uninstall apps in all versions of Mac OS X. Generally, the app you choose have been removd from sight, but to perform the uninstall you will need to empty the Trash. If you fail to move the app to the trash, try to reboot your Mac into Safe Mode and repeat the steps again. Microsoft Word 2016 creates many items (like preference, cache and support files) during the first setup and daily usage. If you decide not to use Microsoft Word 2016, you’d better clear up all its invalid components, to enable a clean uninstall and also to reclaim the disk space. Here’s how to properly detect and remove app leftovers. Type the name of target app or its vendor in the Search Bar, and click on “Library”. 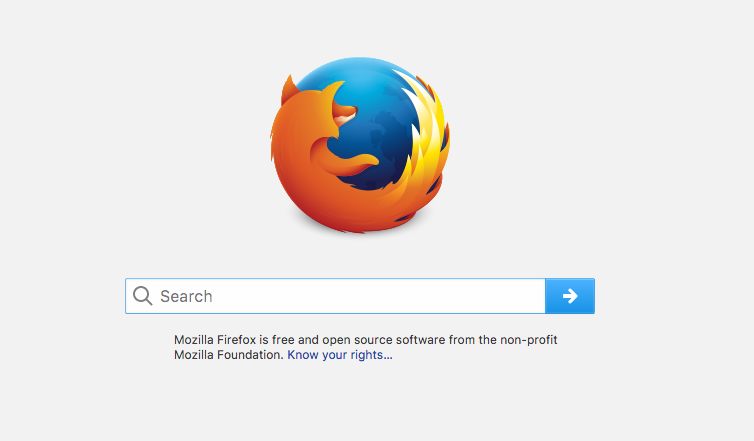 If there are some hidden files you fail to locate or identify, do a web search about the app components. Besides, you can utilize the Terminal app (located in Utilities folder) to list the contents of the directory in question and then delete the offending items. After deleting all associated items to the Trash, you can perfom permanent removal. Again, make sure you haven’t mistakenly delete anything before emptying the Trash. That’s the end for manual uninstallation. Desire to uninstall Microsoft Word 2016 without hassle? You can consider using Osx Uninstaller and set free your hands. Run into issues when trying to uninstall Mac apps? Welcome to contact us for help.